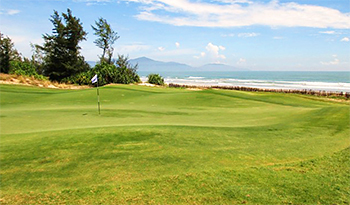 Developed by VinaCapital and designed by Greg Norman, the Dunes course debuted in 2010, the first of two 18-hole championship layouts planned for Danang Golf Club. The sandy soiled fairways on the Dunes course measure a total of 7,160 yards from the Shark tees and they lie on Vietnam’s central coast, next to My Khe Beach. Highlight holes here include strong back-to-back par fives at the 4th and 5th and another long par five at the 10th that winds through dunes in the direction of the Marble Mountains. The 148-yard 16th is recognised as the signature hole, playing to a slightly raised green that’s framed by the East Sea and Cham Islands. 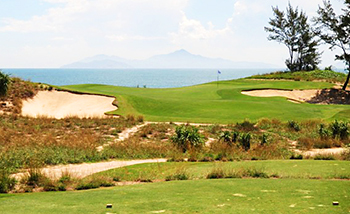 The Montgomerie Links course is located on an adjacent site to the Dunes fairways and both facilities are now being marketed, along with the new Nick Faldo design at Laguna Lang Co to the north of Danang, as must-play venues on the new Golf Coast Vietnam. The tournament playing days of Norman, Montgomerie and Faldo are virtually over but all three golfing greats are still big draws when it comes to attracting golfing visitors to Vietnam. This is my favorite course in Vietnam although I do concede that Ho Tram deserves to be ranked number 1 if that makes sense. This course differs from many throughout Asia as it blends in perfectly with its surroundings and is actually walk able not that many choose to walk due to the heat. The course runs over mildly undulating land with a great mix of holes I found the par 5’s to be the class of the course all head in different directions and have different characteristics the 10th that zig zags through large dunes is probably the best of them. The par 4’s have great variety all different lengths and challenges the short 14th is a cracker drive able from the elevate tee however you need to clear the central bunker which is exactly where you wish it wasn’t there is plenty of room either side of the bunker to hit which side is best depends on the days pin position. The 16th is the signature hole and the pick of the par 3’s a short hole with the beach and ocean behind with islands in the distance this hole has a wildly undulating green that provides the challenge this is the only time this course touches the shorefront. During a recent visit I played the new Nicklaus 9 that bills itself as Asia’s first bulkhead course having imported the bulkheads from Florida I found this 9 very odd it works its way around a lake and seems to have water and bulkheads left on almost every hole except the par 3’s which are water carry the whole way everyone I spoke to at the club hated the new 9 and while the Dunes course was packed I was literally the only golfer on the Nicklaus 9. Best course I've played in south-east Asia. I had to edit that opening - originally I had "best I'd played in Asia", but I'd forgotten about Kau Sai Chau in Hong Kong - that was just too spectacular) Although way overpriced, as seems the norm in Asian golf, at least this course left me feeling that I'd got something special back in return for the significant fees. The piece of land is perfect for golf with a sand base and plenty of undulations and the layout takes great advantage of these. It's visually stunning; well kept by an obvious army of staff (but not manicured to within an inch of it's life like so many other resort courses!!! Big tick for that); and the design is a great mix of short and long holes. I especially loved the stretch from the 13th to the 17th. The long par 4 13th (index 1 and with good reason - good luck getting on for two), is followed by the two short par 4's at 14 and 15 (do you take driver on 14 and try to clear the bunker in the middle of the fairway or throttle down to 3w, but then 3w might reach the bunker as well, so can you aim left or right of it, or do you go down to hybrid or iron and then try to get close with a short iron??? so many choices; this is what makes golf fun!) then the feature hole par 3 16th looking at the ocean and then another long par 4 at 17 that is easier only if you have the right angle into the flag, but that makes the hole longer... Great stuff. I want to go back and play it again right now! Compulsory caddie again (personal hatred of mine) and yet again someone who could only offer the barest of useful golf info. And this time there was complaining and dawdling (I try to walk whenever possible) due to the normal daytime heat and humidity. Should I have just pulled my clubs around by myself: I've done it hundreds of times before??? Also annoyed by the extreme mark-ups on everything (bottle of water for 10 times the price outside the course) and the nickel and diming nature of it. Why can't companies see that patrons are ALWAYS happier when they under-promise and then over-deliver, rather than the other way around. When I've paid well over USD100 for the green fee, why don't you surprise me by providing free range balls and a couple of bottles of water that probably only cost you 20c each? Clubhouse and staff all very nice and the cold shower in the locker room after the game was welcome. But for me, it's all about the golf and this course delivers. Much better than Montgomerie Links next door (which I'd played the previous day). Overrated. Played this track last week, thought it'd be up there with the best in Asia I've played (Red Mountain, Dalat, Siam), but not nearly as good or interesting. I found it a very up and down track, a couple of nice par 5s and a very nice par 3 (16th) but otherwise instantly forgettablee. Greens are excellent though hence 3 stars.Also beware of the F&B. Very expensive...A small bottle of perrier for over 7 USD!! Ridiculous.